What is Global Baptist Church Planters? Global Baptist Church Planters (GBCP) is a local church ministry that helps fund national pastors by working with established, veteran missionaries around the globe. Over the past 14 years, Global has helped to plant over 600 churches in 10 different countries. Successfully supporting national pastors across the globe can be difficult and uncertain. Global steps in becoming a link in a chain that provides trained national pastors with the funds they need to get their church off the ground. By working with an American missionary, we are able to maintain sound doctrine and accountability. The great commission was given by Jesus Christ to His church, and it is through a local group of believers that funds are raised to support missionaries and nationals alike. A church with a burden to see more churches planted gives funds through Global, complimenting their missions giving for an even greater return. It truly all begins with your church. Global serves as the organizational and financial conduit in the process. This ensures the funds reach the national pastors and helps create transparency from start to finish. 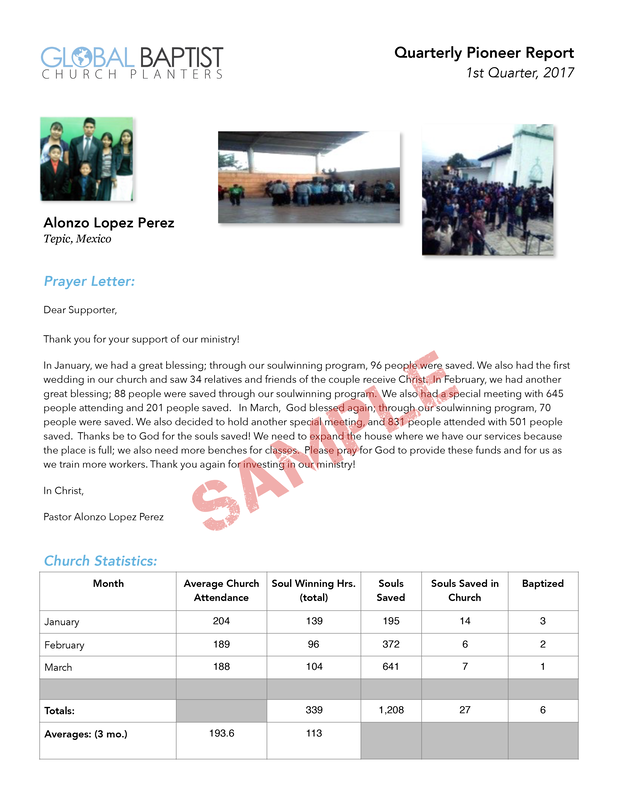 Providing accountability reports from the nationals is of the utmost importance, and Global's team strives to consistently communicate with each supporting donor about their sponsored church plants. The veteran missionaries we have partnered with are the key to Global's success. These men have followed a pattern of building a solid church, starting a Bible college, training young men, and sending them out to start churches of their own. Much prayer goes into the selection of each partner, as they are vital to Pioneer approval and accountability. Global's goal is not to replace the American missionary but to enhance his ministry to reach more souls around the world. A national pastor in a third world faces many challenges. Often, he must work 60 hours a week to provide for his family, leaving him very little time to build a church. Global helps these national pastors (Pioneers) by supporting them full-time. This allows him to focus his time and energy on the ministry and his family. The support is temporary, as the goal is to produce self-sufficient, indigenous churches. During the Pioneer's tenure with Global, he will work closely with the missionary who trained him, providing quarterly accountability reports and prayer letters that are sent back up the chain through Global and to the supporting churches. How does Global maintain Accountability? National church planters report quarterly to their American Missionary Partner. Their prayer letters include pictures and an accountability report. These reports include numbers reflecting attendance, salvations, baptisms, and hours out soulwinning. Our Missionary Partners forward the reports to Global, where the reports are translated, formatted, and then forwarded to their supporting American church. In addition to these reports, multiple visits are made by GBCP staff to inspect and to maintain accountability.